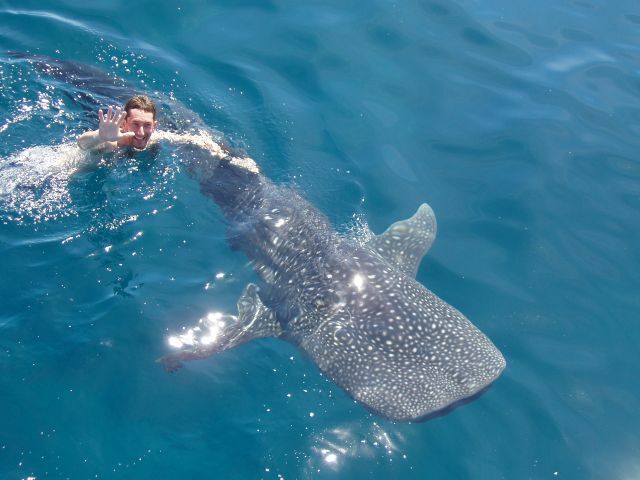 Michael Klein swimming with a whale shark. Michael Klein, 37 and his 13-year-old daughter Talia died the Sunday before Christmas, along with the pilot of the small aircraft in which they were flying across the jungle-covered slopes of the Baru Volcano near the western border of Panama. A Santa Barbara friend of Talia’s, Francesca Lewis, who was the fourth person in the aircraft, miraculously survived and, according to current reports, may have a full physical recovery. I first met Michael in February 2005, almost three years ago, on the front page of the Montecito Journal. In a full-color photo, he was swimming with a whale shark in the waters of the Islas Secas off the Pacific coast of Panama. Inside the paper was a description of a practicing ecologist not of the academic type, although Michael could probably have qualified in academic circles on any number of topics but of the type who has the motivation and the resources to preserve the wild places of the earth which he considered important. I said to myself at the time, “Here is a man I’d love to know,” as our interests seemed to take common paths the preservation of the natural world, hiking, flying, scuba-diving, seeing the unspoiled spots on the planet. Fortunately, we had a mutual friend, and after some telephone conversations, I met Michael in person later in 2005, when I went with him to his islands. He had assembled a group of scientists from the Smithsonian Institute in Panama to study some of the wildlife on and around the islands, but there was no one available to census the bird-life. Having spent quite a bit of time in Costa Rica during the decade of the ’90’s studying birds, I felt I could be helpful, and Michael agreed, so I joined the group. I went again in April of 2007, and will return in January 2008, finishing what appears to be the first methodical study of birds on and around Islas Secas. Michael’s interests ran in any direction that had anything to do with the history and ecology of this group of sixteen islands and the waters around them. They had been essentially unoccupied for about five centuries, and little had been done by earlier scientists, although information exists regarding nearby, larger islands. There are remnants from early civilizations on the island, but they’ve been left untouched in recent years, although some archeological research was done decades ago. Michael was very proud of a collection of ceramic artifacts he had in his office, which were actually from the main island in the Secas group, but he didn’t remove them himself feeling that what is there should be left there but from a surplus from the Smithsonian collection. Michael’s business successes are legendary, graduating from UCSB at the age of 17 and going on to create several businesses which were subsequently sold to such giants as Hewlett-Packard and Yahoo!, gaining an impressive number of awards for his entrepreneurial skills along the way. He ultimately took over a hedge-fund based in Santa Barbara, handling significant amounts of clients’ investments. But it is not his business acumen which I find the most compelling. It is, perhaps, easy to measure the success of a businessman in terms of financial accomplishments. It is not always easy to measure the spirit and core beliefs of such a person, especially one who keeps parts of his life away from public view. I knew him as a thoughtful, intelligent man, in love with just about every aspect of life that came his way. This was especially true in the case of his daughter. He loved the land and the sea, and arranged for the permanent preservation of hundreds of acres of land where he was building a home in the foothills of Santa Barbara, as well as making similar arrangements for his islands in Panama. Although he treasured his privacy here, I like to think that it was at least partly to protect the land, and whenever I’d meet him on the road through his property, he was always gracious about stopping and talking a bit about the history of the land, the flora and fauna of the hillsides, and his plans for preserving it. Michael accomplished much, and would have accomplished a great deal more, as much less than half his natural lifespan had passed when he died. In the short time that I knew him, I saw an undiluted way of living-he seized each experience as it unfolded. We all meet people in our lives who, for one reason or another, affect us and our lives after they’re gone. We are thankful for having known them for a time. In this case, it’s saddening that the time wasn’t longer, as there was a great deal more to share with and learn from Michael.